Despite having been making pens for over 20 years, before I received this pen press for review I had never seen the need to own such a device, preferring to use a bench vice or the lathe tailstock to assemble my pens. I was therefore prepared to be unimpressed, having looked at similar devices in the past which had not inspired me to change my methods. On first appearance this looks superficially like many of the other pen presses on the market, but closer examination reveals a couple of significant differences. 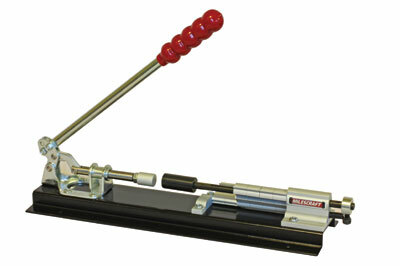 To begin with, the static end of the press is spring loaded so that once positioned, the pen components are held gently in place so that you do not need three hands to operate the press and then, to make things even easier, length adjustment is achieved by means of a series of flip stops which can be flicked back and forward with one finger, making adjustment totally straightforward and trouble free. 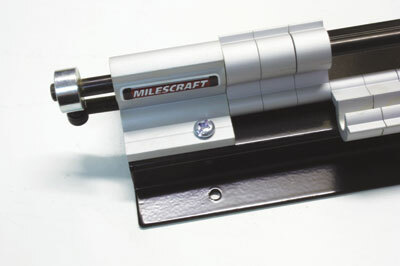 The business end consists of a heavily constructed horizontal push mechanism operated by means of a substantial lever with a soft rubber grip, which provides sufficient leverage to make light work of even the tightest fitting components. All of the components are mounted onto a solid, black enamelled steel frame which is more than adequate for the job and pre-drilled to facilitate bench mounting or fitting to a backplate which could be held in a bench vice. For the purposes of the test I made just such a backplate. In use the mechanism slides smoothly but firmly and feels extremely robust and the set up and adjustment is so easy that I found that I used the press all the time instead of my usual methods; despite my preconceptions, I could definitely find a place for this little device in my workshop. Build quality and finish are of the highest order and I can thoroughly recommend it.